I love Valerie's preschool. It's a great place and I have had no complaints whatsoever!! Valerie is going to the summer camp program right now, and she is having so much fun. My gripe isn't about the school itself, but about the parents!! Thursday is water play day, so the kids wear swimsuits under their uniform. After water time is done, they put the wet clothes in their cubby. (Each child has a labeled cubby for their things.) Well... a few weeks ago swim time had ended just as I got there and the children were in the process of putting uniforms on. Val was still in her bikini, so I took her things out of her cubby and she didn't change. I open her bag at home to find her undies and a wet towel. No uniform. We asked at school the next day, and of course they never found it. Then last Thursday Valerie came home in some other girl's underwear. "Rebeka" was written in them. Also, Val's gray shorts to wear under her uniform dress and undies were missing. I understand things happen and it can be chaotic getting the entire class changed out of wet clothes. Somebody likely gave Val the wrong bag. What I don't get is when the child gets home with the wrong clothing items..., or an extra uniform... why don't the parents return it to school?? If some little girl went home wearing a uniform dress, and had a second in her bag, why did they keep it? It has Valerie's name in it, so it would have been very obvious that the wrong child got it. In the mean time I'm out a $15 uniform. I put "Rebeka's" undies in a ziploc with a note and had Valerie give it to her teacher today. I sure don't want them. I wonder if we'll ever see her gray shorts again, or if I'm stuck buying a new pair. After two years of talking and debating, we finally did it. I spent a few weeks researching online. I looked at the calendar and picked out dates. Clint put in his vacation request, and we waited for his boss to approve it. Done. So I did it! I booked our Disney Vacation!! The last time we went was 2004. This will be our first trip with kids, so it will be a new experience. Doesn't this look lovely? 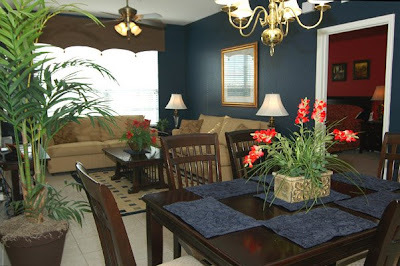 A beautiful 3 bedroom , 2 bath condo for just over $100/night. 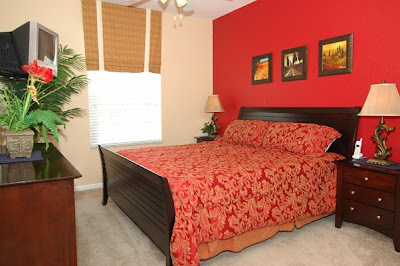 One mile from Disney property. I know Disney isn't exactly a relaxing vacation. I don't plan to kill ourselves trying to do or see everything. I don't expect to spend more than 3 days, 4 tops at the parks. I want this to be for the kids. They will plan our day... they will decide the majority of what we see and do. We will go at their pace. We'll have seven days of fun! I can't wait for October!!! Yesterday was not a good day. It was very sad. Wish I could have stayed in bed with the covers over my head. I kept remembering last year. We knew it was going to be my Mom's last birthday. We were still in shock though. It just didn't seem right to celebrate. I didn't know what to DO for it anyway. She was not herself at that point. We had to struggle to reason with her to put on clothes. I always gave her flowers for Mother's Day and her birthday. I put flowers at her grave this year. Even my Dad, who NEVER gave my Mom flowers, brought roses to the cemetery. I know people mean well, but telling me to focus on happy memories or celebrate anyway does nothing. Today was a little better than yesterday. But I am still so sad. It was a Wednesday. We were going out to dinner with my parents at Tampico's in Morgan City. Yum yum!! The best Mexican restaurant around. It was our usual hot spot about every occasion that required celebration. I SO wanted a pina colada. Theirs are divine!! I was looking forward to a yummy dinner and my sweet drink, and of course the chips and delish salsa. Clint worked in Lafayette that day, so he was meeting us at my parents' house since it was on his way home. Valerie was 18 months old. I was busily packing the diaper bag, doing my hair, make-up, getting Val bathed, and dressed nicely. Typical stuff. I wanted to get to my parents' house a little early. We were going to be later than I intended. Suddenly as I was gathering the last of our things, a thought popped into my head. Maybe? Hmm. But I didn't think so. But some weird things had happened a few weeks earlier. Girl things. It just wasn't possible, was it?? But then I wanted my pina colada, but I wondered if I should have one. I was practically on my way out the door with Valerie. I decided to hell with it... I put everything down. I quickly dug around in the bathroom cabinet and found what I was looking for. Thirty seconds later I saw two lines. First reaction was. OMG. Two lines????? WTF??? I snapped the cap on the tiny plastic stick and found a small box. Wrapped it up pretty, with my (huge) surprise inside. I told no one. The drive to Morgan City was a blur. My Mom looked at the cake I had made for her and said how pretty it was. I was taking cake decorating classes, so I had practiced my skills. We chit chatted. Made a fuss over Val. The usual. I tried to act normal. I didn't want to see too anxious for my Mom to open her gift. Clint arrived. My Mom finally asked if she could open her present. Sure. We went out to Tampico's as planned. Still pretty much in shock. (No, I did not have a pina colada!!!) We stopped at CVS on the way home and got a second test. The first one was old, remember?? So I needed a newer one to be certain, right?? Same results. Two lines. Oh my. And that was how and when we found out Veronica was on her way. Happy Birthday, Mom. She would have been 75 today. I'm clueless as to what these actually are. Made as per request from a friend! Veronica is doing really well in her big girl bed. I lay down with her every night and she snuggles close to me. She asked me to tell her a princess story the other night. She put her sweet little face close to mine and rested her arm around me. It was just the sweetest thing!! She is growing up so fast. I'm glad she took so well to her new bed. Although I am probably jinxing myself by saying that!! It has gotten a little harder to get both girls down for the night though. I'm being pulled in two directions and I can't be in both rooms at once!! We all pile in Val's bed to read three books. Then I have to lay down with Roni in her room and we talk about her day to give her some one-on-one time. Then it's back to Val's bed to tuck her in and get her settled. If Roni isn't sleeping, she's calling me back... then Val is crying for me... and so forth. I suppose one day I will miss all of this neediness. Now though I am just so tired by the end of the day it sure would be nice to have a few more minutes of quiet time. So yesterday we took down Veronica's crib. Sure it was converted to a toddler bed, but it was still a crib. I stood there looking at it for quite some time thinking this is the last baby bed we'll ever have. I won't lie; it made me sad to see it go. My "baby" is not really a baby anymore. I still refer to her as "the baby" in passing, but people, she's almost 2-1/2!! It was time for a big girl bed though. Every night Veronica would cry "sissy's bed!" She'd toss and turn in her little bed and kick the slats. 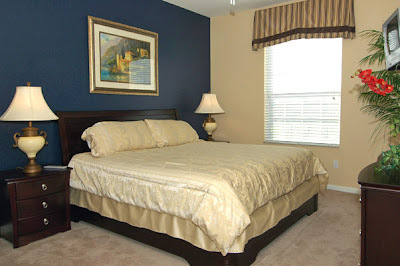 By bedtime, Veronica had a nice, new, yellow bed!! Both girls had a ball checking it out. The three of us snuggled in it to read stories while Clint hung out on the bean bag chair next to the bed. Val went to her room after the stories. And all hell broke loose. Veronica threw the biggest tantrum. Kicking and screaming and throwing things. She still wanted in Sissy's bed!! I guess we made a big mistake in deviating from the normal routine. Finally I sat with her on the couch and played old Sesame Street clips on YouTube until she went to sleep across my lap. We put her to bed, and at midnight she was up again. Screaming like a banshee. Just as pissed as she was before. About 1am she was finally asleep again, and thankfully she slept until 8:30 am. Yes, in her big girl bed. I suppose it will take her some time to adjust. 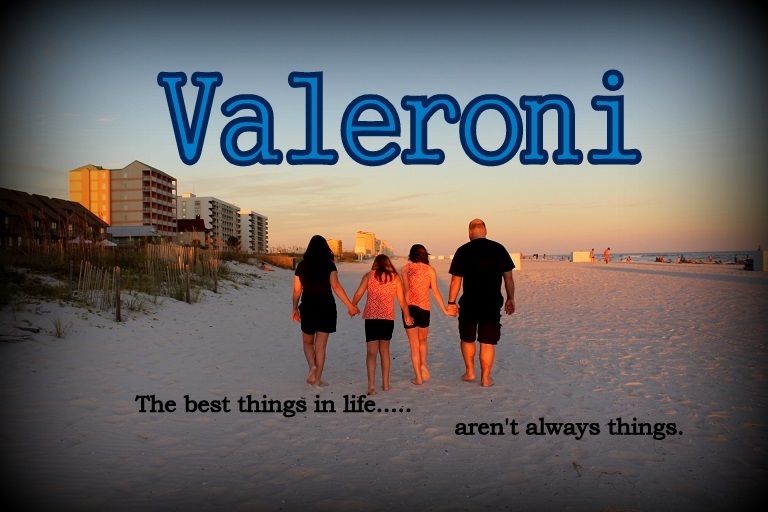 Veronica is definitely a child who thrives on routine and does not take well to change. One year ago today we found out my Momma was going to die. Shock, disbelief, denial even.... barely scratches the surface. It was never said point blank, but we knew. Yet, there was so much we didn't. It doesn't seem like a year has gone by. For so long I replayed the doctor's visit over and over in my mind just trying to make sense of it all. I can still hear my Dad saying "It's hard to believe this is happening." I don't want to remember, yet I don't want to forget either. 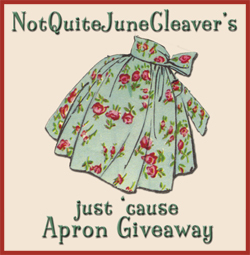 Hey everybody, check out NotQuiteJuneCleaver's apron give away! good luck! We had lots of family and friends over for our annual 4th of July party. LOTS of food, a bit of alcohol, and good company! What's better than that? 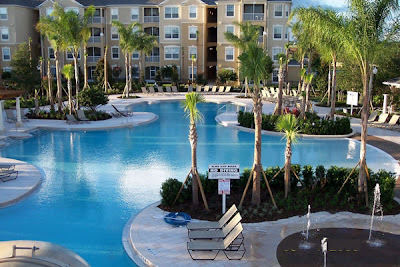 All the kids enjoyed the pools and fun in the sun. Tonight we sat on our front porch and watched the fireworks all around us. Valerie loved them, but Veronica was a bit scared. She was better once we came in and watched from the windows. My house is a COMPLETE disaster!!! The pool was even full of mud so we had to drain it! We are all exhausted. What a great day!!! Thanks to all who came and made the party a success. Happy 4th of July everyone!